Hi, I am Yoshida from the Research & Engineering Department. I work as the director of the Internet Channel. I am Imaizumi from the Entertainment Analysis and Development Department (EAD). My tasks include sharing information with other development teams within the company, and working as the liaison between our team and our oversea subsidiaries. Hi, I'm Furukawa, and I'm also from EAD. I'm responsible for the controls and supervising the design. I am Shirakawa from the Product Development Department. I work on the collaborative process regarding the Channel's engineering aspects like its programming with Opera Software, a company that develops Internet browsers in Norway. And I am Horie of the International Business Administration Department. My duties involve maintaining communications and coordination with Opera Software, and I also work as the interpreter. 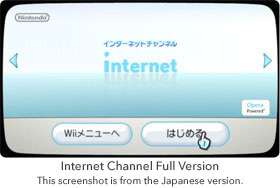 In the Internet Channel, you can view websites and surf the Web on Wii. You can download the trial version from the Wii Shop Channel right now, and we're working very hard as we're in the final process in developing its full version, which is scheduled to be released very soon. On a computer, you use software called a browser to view websites, and the Internet Channel on Wii is based off of a browser called Opera, which is developed by Opera Software. Opera was originally a browser designed for PCs, but seeing how the browser's performance was being noted for its stability and performance on devices with limited features like a cell phone, we decided to go with Opera because we felt that is was suited for Wii. When developing a video game, usually the development team is in full control of exactly what's going to be displayed on the screen, from the beginning to the end of the game. But with websites that are going to be displayed on the Internet Channel, to be a little exaggerated, there's no idea where this data comes from since all these sites are developed by different people working with different environments. In that sense, there were many more cases of trial and error involved in this process compared to making a video game. When it came to displaying all the various websites, Opera Software's rich experience helped us greatly. As a company that specifically develops browsers, they had an extremely extensive test case knowledgebase. In return, we were able to closely share our knowledge that Nintendo has accumulated over the years making games, regarding how the controls should be and how the UI should be displayed on the screen, and I think Opera Software is bringing those aspects to life really well in the soon to be released full version. At first, we had slightly different views regarding things like the way the controls felt. There were times where we built a prototype here at Nintendo that we showed them on several occasions, thinking it could better explain to them how we wanted the browser to be improved. We felt that this worked better than writing things down in a request form. Also, to better describe what we wanted, there were times where we actually went to Norway where Opera Software's headquarter is located. Even though it was in Norway, all the communications were done in English, so I didn't feel that much of a language barrier. Since Japan and Norway are in different time zones, there were some times where it was difficult synchronizing the development timing. At first, there was a gap in the philosophy Opera Software had towards PC software, with the philosophy Nintendo had towards video game software. Browsers on PCs tend to be made feature-rich so that it can perform multiple tasks, and I think this is a culture that is specific to PCs. Many features are put in, even though they further complicate the controls, and without a manual, it's hard to understand all the features. On the other hand, at Nintendo, we develop software emphasizing the importance of how the users can easily navigate through the game, without having to look at the manual. When we first envisioned using the Wii Remote so people could navigate through websites with one hand, we felt we could utilize the Wii Remote's intuitiveness where you are able to "point" directly at the screen, even though it may not be suited to perform precise movements like a mouse on PCs. 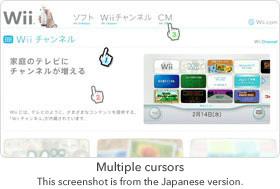 For example, the cursor of the Wii Remote appears as a very large pointing finger on the screen of the browser. The cursor has looked like this from very early on in the development process. You're able to tell right where it is on the screen, and it's also the perfect size when you zoom in on the screen. I think this turned out to be something that is easy to use, even for grandpas and grandmas. The other thing is, when you release a video game for home consoles, you need a lot of time before it can be released because of all the testing involved. It's a world where we work with things like discs and ROMs, and once they are released, there's no turning back. But in the case of a PC software, it is common to release downloadable updates, and users are accustomed in having to restart the software once something goes wrong. But things like that are absolutely not acceptable in the world of video games. So for us, releasing even just one title requires a great amount of preparedness. In the early stages of development, I think those differences were shown by our different development speeds during the early stages. The Internet Channel was created from the concept of bringing the Internet to the living room, from the very beginning of its development. As we were thinking of what would be the best way to display websites on Wii, we came up with a vision where you're able to casually sit on the couch, and be able to just browse through the websites with one hand. Opera Software understood this vision of ours, and from that point on, the differences we once had regarding our goals had started to drift away. The thing was, at those first stages of development, I couldn't let go of the image that I had of conventional browsers on a PC, and I had a hard time deciding on how much of the browser's features I should leave for the Wii version. Around that time, a co-worker happened to walk by and look in on the screen that I was working on, so I started talking to him about how it worked. Right then, as I was walking through the features with him, it struck me. PCs are something that only one person would look at by themselves, but that experience that I had at that moment, was made possible only because we were using a TV screen. After that, I was able to cut off all unnecessary features that were not needed as a browser that was designed to be used on the TV. Honestly, I first had negative opinions about the Internet Channel. But when I tried the Internet Channel with my son at home, we had a blast. He got really excited when I zoomed in on pictures of big commercial vehicles like a trash pick-up truck on the TV! (laughs) That made me realize that this could have only happened on a TV. I think it's very convenient to be able to research the movie or the TV show you were just watching, without having to get off the couch. It takes a little while to walk to the room with the PC, and wait for it to turn on so you're able to surf the web with it. Lately, there are a lot of TV commercials with Internet search keywords in them. Those things are perfect to look up on Wii. The full version will come equipped with a search button, making it even easier to look things up about what you have just seen on TV. And just so people can gather around in front of the TV and have fun, the full version can display cursors of multiple Wii Remotes. You still can only control the Channel with the first Wii Remote, but now others can use the cursors to point at things on the screen, to communicate where they want people to look on the screen, or where they want the person with the first Wii Remote to click. After releasing the trial version of the Internet Channel, we were able to see how it was received first hand, by seeing how our family and friends were talking about it, and we also received feedback about the trial version from a large number of people, through customer support and questionnaires held over at Club Nintendo. Things like the search button and the half-visible cursors, were created reflecting these opinions. Compared to the trial version, the features that especially changed are the zoom, scroll, and the response speed. First, there are now two types of zoom in the full version. The first type is the same as the one that was in the trial version, where it automatically determines the zoom level and zooms the area where the cursor is. The new second type in the full version is a multi-level zoom feature, where it can zoom in on the page in set zoom levels. Customers are now able to choose the one they like better from these two zoom types. We're using a feature called "Outline Font" in the full version, so the words will never be blurry no matter how much you zoom in on them. Even when you zoom all the way in on the text, the words will display clearly. Also, to make the words easier to read, we actually cut back on the screen size so the page width will be displayed at 800 pixels, even on a wide-screen TV. The viewable area will not be as big as it could have been because of this, but I think the screen became a lot easier to see. We also received a lot of feedback about the scroll feature. We received a fair amount of comments about how people had trouble figuring it out. Some people weren't able to figure it out at all. So for the full product, we made about eight different prototypes of new ways the websites would scroll. We had people try them out within the company, and out of the eight, we went with the one where people had told us that was the easiest to understand for people trying out the software for the first time. The new scroll feature works by pressing the B Button, and depending on what part of the screen your pressed it, and the direction and the distance you move the cursor, it will change the scroll speed...This is really difficult to explain in words, so I really would like people to try it our for themselves. Also, the new scroll feature will display a guide from the moment you press the B Button, so it's easier to tell in what direction and how fast you're scrolling. And also in the full version, you're able to scroll using the +Control Pad. I think being able to scroll with the +Control Pad is a nice touch, since you can scroll without having to point to the screen. The other feature that has really improved is its responsiveness. Many people had pointed out to us about how much time it took to load the Channel, and how long it took to display the Favorites. These were things that we were very concerned about as well, and improving their responsiveness was our top priority. As a result, we were able to shorten the initial startup time by more than five seconds, and the Favorites menu can be used right away once it opens, even if you added a lot of sites to it. Regarding the Favorites and the initial startup time, we checked the program thoroughly, and we fine-tuned it going to great detail working closely with Opera Software. This is where our development experience here at Nintendo had paid off. However, I do feel that I want to shorten them even more before the release. In the full version, the toolbar displayed on the bottom of the screen will be equipped with an auto-hide feature. We received so many request from our customers that they wanted to be able to hide the toolbar. To be honest, before we released the trial version, we had made the toolbar so that it could have been hidden. But we really couldn't justify adding that feature at the time because of concerns on how some people might not be able to understand the controls once the toolbar became hidden. But through the trial version, we felt a firm conviction that our users can definitely benefit from this feature, so in the full version, our customers are able to choose from different modes like the one where the toolbar will hide automatically after a while, and where the toolbar will hide away with a press of a button. As far as deciding on the perfect timing of when the toolbar should hide, we are spending a lot of time on it right now in deciding on its final timing. The current toolbar feature was made after many debates and discussions on how to resolve issues and concerns like how the auto-hide feature may interfere with the clicking. People may think hiding something is easy, but it's really not easy at all because it has to work on all the various websites. We also received a lot of request about adding a keyboard hardware. At this time, Wii is not compatible with an external keyboard because of concerns like cost issues, but I do think it would be useful for text input, and it's definitely something to think about in the future. Also, with the software keyboard in the Japanese version, it's hard to tell the difference between the single byte and the double byte modes,1 and we had received many questions from people in Japan about not being able to figure out how to type in single byte mode. Of course, in the full version these two modes in the Japanese version will be a lot easier to figure out, and for all versions, fixed URL text that are commonly used like "www." and ".com" are displayed on the URL input screen, and they can now be easily entered. I think the usability has increased dramatically. We were also able to resolve a lot of websites that were not compatible in the trial version. For example, the Japanese social networking site "mixi", which we received a lot of feedback from our customers in Japan about, is now compatible. But the thing is, although we are working on it daily, the World Wide Web is ever changing, and there are a lot of times where the site's feature would change as we were working to make that site compatible, so it's a time consuming process. I would like to take this opportunity to talk about the release date of the full version. So far, we have announced that the full version was to be released by the end of March. However, due to the many feedback we received from our customers from the trial version, all the improvements that are to be implemented like the ones we have mentioned, and with fine-tuning the Channel to make it as compatible with as many websites as possible, the development process is taking longer than expected. Unlike the trial version, as we would like to thoroughly tune the Channel to ensure all the features that we would like to go in it are implemented, we are currently working so that the full version can be downloadable from the Wii Shop Channel sometime in April. I apologize that these issues have delayed its release, but I can tell you that we are working very hard on it, so please be patient while we are finalizing the full version. Ever since the Internet Channel was released, a lot of websites have appeared that are designed just so they could be seen on the Internet Channel on Wii. So far, all we did was create the browser. However, many of our customers are creating their own contents for it, and a lot of people are enjoying these websites. Knowing that in a part of the world that's completely beyond our reach, that there are people doing these things that are making the Channel more exciting, is something that I am truly grateful for. Out of those websites, some had surprised us; they did things we haven't even thought of with the Internet Channel. There was even a website that one of our customers had created, that just happened to look like one of our plans we had in the drawing boards here at Nintendo. I think this is the first time a Nintendo product has spurred this much creativity from our customers. I think this is a bi-directional relationship where we created the box, and our customers created its contents. Thinking how it could expand in the future makes me very excited. It feels like our customers had firmly caught what we had passed on to them, and they have passed it backed to us in return. With the trial version, it felt like we were able to play a good game of catch. Including the criticisms, listening to all the different feedback was truly a good experience. I would like our customers to try using the Internet Channel while the family has gathered around in the living room, and try visiting a website. If other people are watching that website with you, I think you'll see that website in a different way than when you looked at it by yourself on a PC. I definitely would like people to use this Channel with their family. Recently, the amount of video content has dramatically increased on the Internet. Videos and TVs match extremely well, so I really would like people to see this video content using the Internet Channel. If a lot of people started to watch Internet videos on their TVs, I think it could become a tremendous turning point in the history of the Internet. The World Wide Web that up till now was something that was almost exclusive for the PC making its way to the TV, I think is a very big change. In the future, we may see more content that is created specifically to be viewed on TVs, and maybe one day, it may eventually turn out that websites are something that you see on a TV! I would like for an opportunity to be able to provide people where we could help them develop websites that are designed specifically for Wii, that are different from a website for PCs. 1. Single byte and the double byte modes are two input methods on a Japanese PC. The double byte mode is used when inputting mainly Japanese characters, and the single byte mode is used when inputting English alphabets and numbers, like a URL address.